As soon as Kelly laid eyes on Jacob, she was taken aback by his charming smile and radiating personality. She was smitten with him instantly, and that feeling never left. On the night of the proposal, Kelly and Jacob were vacationing in Virginia Beach, and Jacob was being particularly lovey-dovey as they were sharing a walk on the shore. Kelly noticed that Jacob kept walking faster and faster, and suspected that something was up. Sure enough, he eventually got on one knee and popped the question. That moment, Kelly says, was like music to her ears. 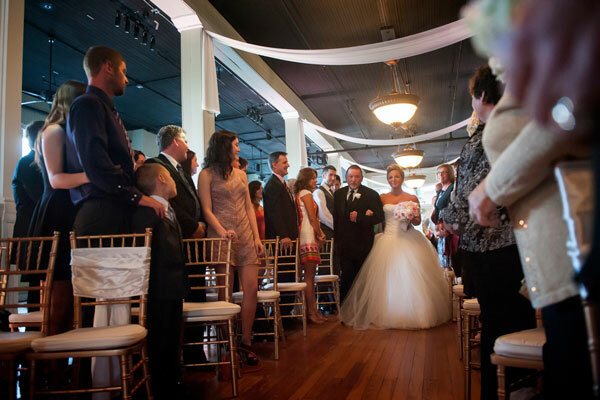 The impact of the wedding didn't hit Kelly until right before the processional. She was overwhelmed by emotion as she held her father's hand and gazed at the man that would become her husband. When she finally reached the end of the aisle to meet Jacob, she was overjoyed and wanted to savor every moment of their special day. Jacob and Kelly chose a venue that was both classy and unique. It was a renovated factory building with large, breathtaking windows and an impressive grand staircase. The building required few decorations, so the couple focused on using lighting to give warmth and brightness to the ceremony and reception. The dramatic lighting complemented the sleek and simple wedding colors: black and white. Kelly and Jacob even included a large, exclusively black and white candy buffet as a guest favor to compliment their theme. The flowers also proved to be a stunning addition to the evening. Kelly got her florist to pick flowers that looked just like peonies, even though peonies were out of season. The blush tones in the bouquet softened the black and white perfectly. After the ceremony, guests had fun posing in a photo booth wearing props like Viking hats and oversized sunglasses. Additional, Kelly's sister painted a canvas with a huge red heart for guests to sign instead of a traditional guest book. This was a huge hit, and added a truly unique touch to the reception. Be sure to see the Parry wedding on page 88 of the third issue of bridebook!